26 februari 2010 | In Uncategorized | Comments? 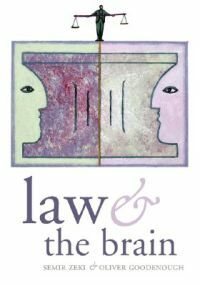 ”Hey!” someone with the authority to command my attention wrote to me today ”You should take a look at this book” and then there was a link to ”Law and the Brain” by authors Semir Zeki and – wait for it – Oliver Goodenough. I congratulate you, Sir, on a fabulous name. Those, ”good enough”, are also the two last words of my dissertation. As if the title and the splendid collaborator and the recommendation weren’t enough the get me to read the book, some mechanism of nominative determinism seems to drive me towards it as well.